Star Wars fans will love the drone that I have up for review today. 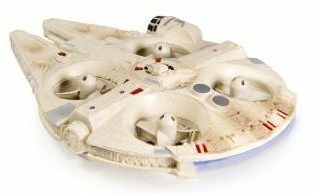 We’re going to be taking for a spin a fully working drone copy of the Millennium Falcon. 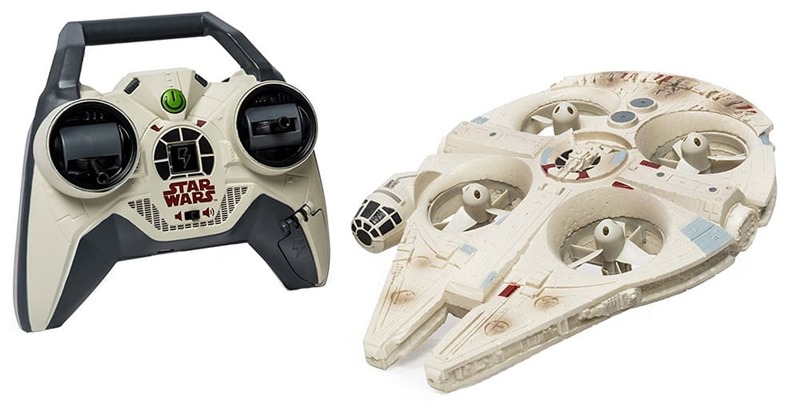 Air Hogs, the children toy company that released some very interesting drones as of late, made a deal with Disney, I presume, and it now pumps out drones that are copies of star ships from popular movies like the Star Wars. That’s why today we have the pleasure of flying an actual Millennium Falcon and I have to say that it isn’t quite bad. Let’s find out more about it in our Air Hogs Millennium Falcon review ! Just look at it in all its glory. Air Hogs, the Canadian RC toy manufacturer, really did a good job at capturing the look and feel of the fastest ship in the galaxy. Now obviously it wasn’t possible to create an identical replica and Star Wars connoisseurs among you will point out that it lacks the communication antenna, or this part, or that part. Keep in mind that this is a $100 childrens toy, so don’t be too hard on it. A larger XL version of this drone is also available from Air Hogs. 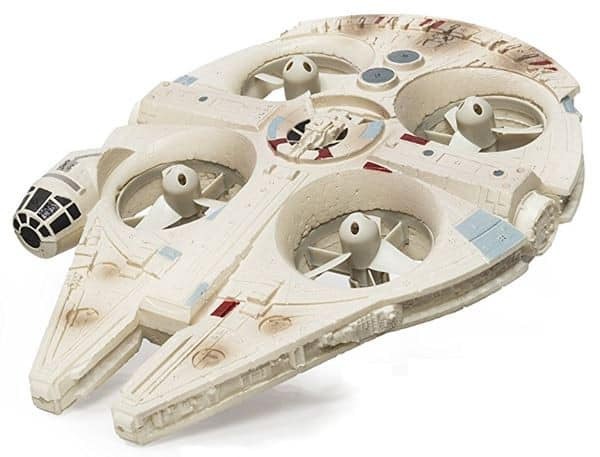 Air Hogs Millennium Falcon XL is around $300 and from what I hear, it doesn’t fly anywhere near as good as this smaller version of the drone does. Avoid the XL at all costs. Obviously as far as the design goes, it has the best possible design you can imagine, that of the Millennium Falcon. I think that’s all you need to know about the drone design. Millennium Falcon. It’s not an exact replica. 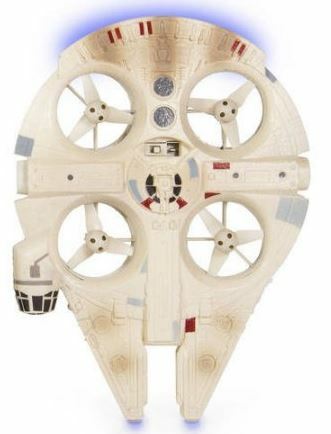 There are a some major differences between the original Millennium Falcon and the Millennium Falcon Drone, starting with the four round slots to accommodate the drone motors and blades, for example. Still the overall design is very recognizable and you’ll surely turn a few heads and answer questions like where you got the drone after taking it for a spin at the park. 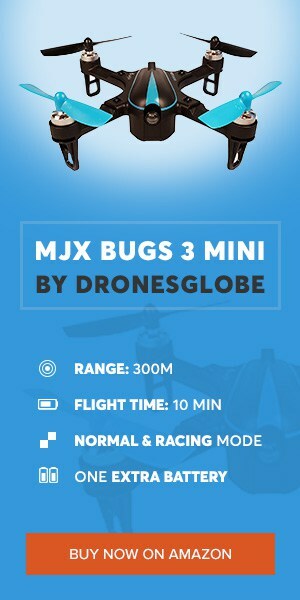 Dimensions of the drone are ~25x18x5cm. It’s not exactly a small drone, but again, it’s not that big either. You can comfortably fly it indoors without worrying about bumping into walls. Air Hogs actually recommends this drone to be flown indoors only. I guess it’s not aerodynamic enough to battle winds. Like at all. Body made out of resistant foam helps protect the motors and blades if crashes and bumps do happen. There’s no camera, FPV, app control, altitude hold, headless mode, or anything like that. It’s a pretty simple drone without a lot of bells and whistles. 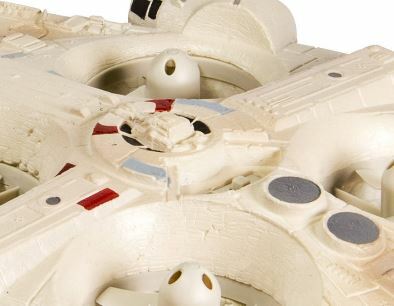 What makes Millennium Falcon drone interesting? So let’s start the review by talking a little bit about the drones’ body and by giving a few warnings/pointers for those who decide to buy this little guy. It is important to keep in mind that the body is made out of foam. That means that the body isn’t rigid, it can be bent. Don’t worry though, it’s a very durable foam covered in rubber, so it shouldn’t break that easily. A little piece of advice, don’t be too rough when handling the drone, just in case. It will survive bumps and crashes just fine, but if your kid decides to do a durability check, like kids usually do, then it will break and you’ll be out $110. 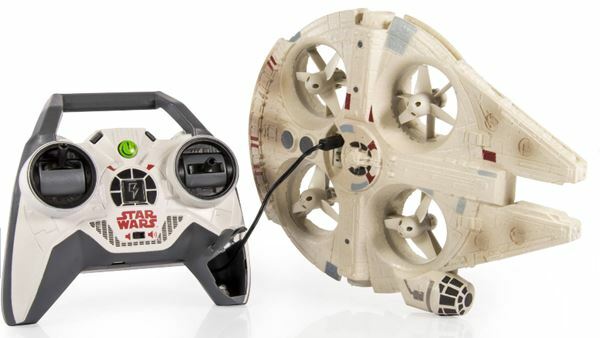 Transmitter that comes with the Millennium Falcon Drone is perhaps even more interesting than the drone itself. Its large size and ergonomic design makes it very comfortable to hold in hands. A giant Star Wars logo is printed in the middle, which is very cool. Just above the logo you’ll find the status LED. That’s the large square with lightning bolt on it. Giant green button up top is the on/off button. The two joysticks are in the usual 4 channel configuration. Left joystick controls throttle and yaw, while the right one pitch and roll. Range of the transmitter sits at a solid 60 meter, or about 200 feet. Controlling the drone is slightly more difficult, but I talk a bit more about that a bit further down below. Something that surprised me about the transmitter is that it has a built-in speaker. Check out the speaker grill and volume slider underneath the Star Wars logo. You use the speaker to play random Start Wars sound effects by pushing the left front trigger. Normally Air Hog drones have the front triggers setup to perform tricks. Since doing tricks would be a bit impractical on a drone of this shape and size, Air Hogs decided to include sound effects instead. About a dozen effects are available. They are the usual R2-D2 beeping, Millennium Falcon going into hyperdrive, laser beams firing, etc. I’m sure that sound effects are one of the reasons why this drone requires 6 AA 1.5V batteries. On the practical side of things, another reason why the transmitter needs 6 batteries lies in the fact you can use it to charge the drone. Right grip of the transmitter has a small latch that opens up. Inside you’ll find a charging cable that plugs directly to the drone. This cable acts as a pass-through. Notice that the transmitter has a micro USB plug on it. So it goes like this, you plug the transmitter via micro USB, open the latch, take out the cable from inside the transmitter and plug it to the drone in order to charge the drone. Very useful, indeed. Like I said, transmitter is almost as interesting as the drone. On the included video down below you can see Millennium Falcon Drone in action. The real reason why I included the video down below is the demo of the transmitter sound effects. Make sure to watch the video long enough to enjoy those. Left front trigger is used to activate the sound effects. 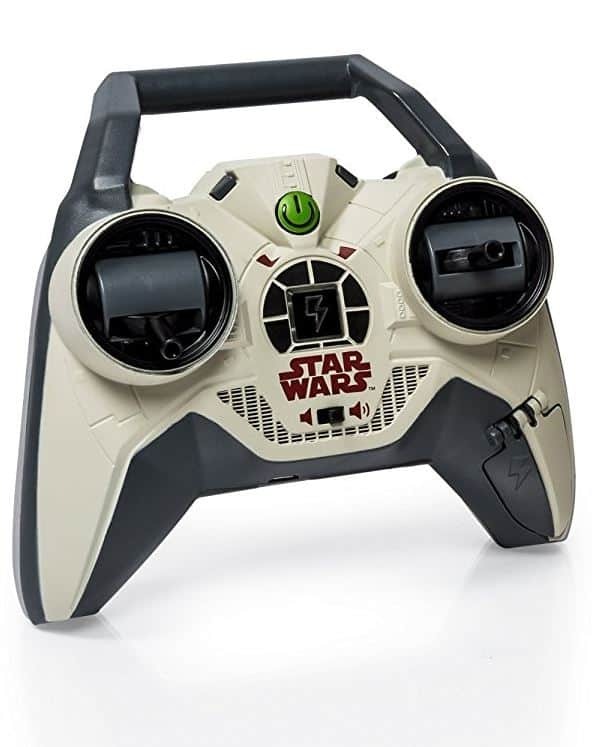 The Millennium Falcon Drone comes with the same type of battery that all the other Air Hog drones that I’ve reviewed up until now have. It’s the 140 mAh Li-polymer battery that gives the drone about 5 minutes of flight time on a single charge. For a $110 drone that’s really not much. I could maybe let it slide if it wasn’t for the fact that the battery is soldered in, non-replaceable. This means that you need to wait for the drone to charge before flying it again for about 5 minutes, then waiting for it to charge again. See how this is very impractical. 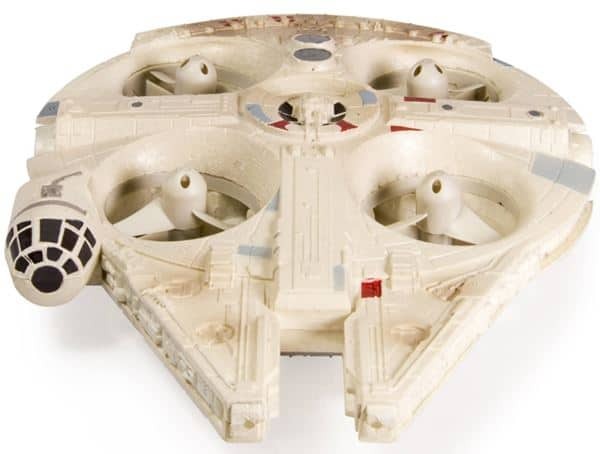 They should have designed the Millennium Falcon Quad Drone with a replaceable battery, just like they should have designed all their other drones with a replaceable battery. It’s a shame really. Well I already covered pretty much all the more interesting features that this drone has to offer. The one thing that I didn’t mention are the LED lights. Normally when doing a review of a drone I don’t talk about LED lights specifically. However, seeing how Millennium Falcon Quad has excellently positioned LED lights, I can’t help not to talk them. LEDs are placed along the back of the drone and the front, so that when you flying at night time it look as though it is in hyper drive. Very cool to watch, especially outdoors. That’s about it when it comes to additional features. There’s no altitude hold, headless mode, camera, FPV, VR, etc. Flying the Millennium Falcon Drone is a lot of fun, indoors. With outdoor performance I was bit disappointed to be honest. Controls are not very precise, or the drone just isn’t that responsive, I’m not sure what it is exactly. Something just felt off when trying to fly this drone outdoors. It does not like the wind at all, which is why Air Hogs recommends indoor use only. Overall I enjoyed flying this little guy.